This post is brought to you by Silk’n Flash & Go. All opinions are my own. While I generally like being a girl, there is one aspect that I really don’t love: shaving! I’m pretty sure I’m not alone in that. I’ve never met a girl that says “hey, I’m so excited, I get to shave today!” So when the Silk’n Flash & Go Luxx arrived, I was anxious to try it out! 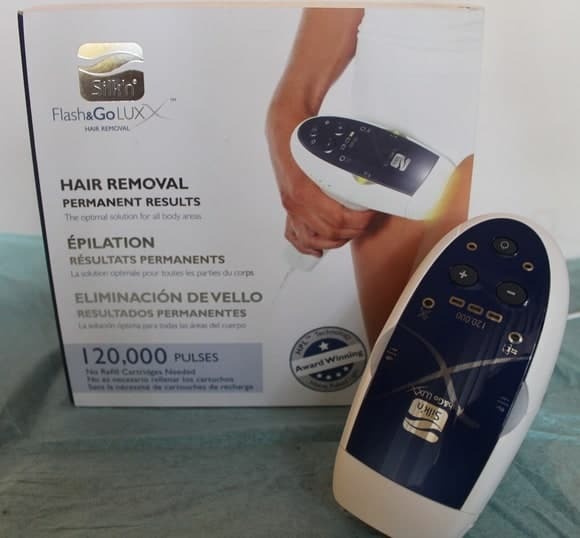 The Silk’n Flash & Go Luxx is a cool device that uses Home Pulsed Light (HPL) technology to help remove unwanted hair and effect long-term hair reduction. What does that mean? Well, basically, it reduces the amount of hair that grows back in, either permanently or at least for a long time. I am going to be honest, even though I was super excited about the idea of long-term hair reduction, I was a little nervous too. I was terrified it would hurt, even though it’s basically painless. The instructions said there may be some mild discomfort in the area that you are working on. I see those words and think “excruciating pain.” It’s important you know how much of a baby I am about pain, so you will believe me when I tell you that it really doesn’t hurt! I finally worked up the nerve to try it out on the lowest setting. First, I shaved my legs, because you have to do that before you use Silk’n Flash & Go Luxx if you want to get great results. Then I propped my leg up on my bathroom counter, followed the instructions and got started. I’d say a good 90% of the time, I didn’t feel anything except maybe a little heat. Every now and then, I’d hit a spot where it felt like a light rubber band snap. That’s it. Even I can handle that! Now, with Silk’n Flash & Go Luxx, you have to use it several times to really get long-lasting results. Each session should be four weeks apart. I’ve only done one session so far. When I did it, I actually did one leg, then the other a few days later. Here’s what I noticed: while I can’t expect to see dramatic results after one session, I did notice that the leg that I did first had slightly less hair growth than the untreated leg. It seems to grow in a bit slower too. As I continue sessions, I’ll come back and update this post with new results. Who can Use Silk’n Flash & Go Luxx? Silk’n Flash & Go Luxx is ideal for those with light to medium skin. I have my dad’s Irish skin, so I’m pretty pale. The Silk’n Flash & Go Luxx has Skin Color Sensor technology inside to check your skin tone first, to make sure that it’s okay to proceed. You shouldn’t use Silk’n Flash & Go Luxx on tattooed skin or areas with open wounds, eczema or other skin conditions. You also can’t use it after you’ve been tanning. The manual has a list of warnings, it’s important to read them before using. If you’re uncertain about whether you should use it, talk to your dermatologist. Some people can experience redness after using Silk’n Flash & Go Luxx. I have pretty sensitive skin and I didn’t notice any extra redness. I did, however, notice that my skin is drier after doing a session. This is common. Just be more diligent about moisturizing (but not BEFORE using, you need to start with clean, dry skin). 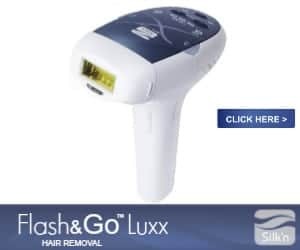 If you’re looking for a long-term solution to getting rid of unwanted and willing to put a bit of time into it, the Silk’n Flash & Go Luxx is a great way to go. Follow Silk’n Flash & Go Luxx on Facebook and Twitter to keep up with news. Have you tried the Silk’n Flash & Go Luxx yet? Would this make your hair removal routine easier? Make Your Monster Bash Even Spookier With Our Virgin Zombie Halloween Drink! I’ve always wanted to try one of these in home treatment because it’s so expensive getting it professionally done. Will have to check this out. I have not found a reason to shave more almost 30 years! I will share this with my friends who shave because it seems like a really nice product. This will probably do way better than the old razor. Thanks for sharing. It’s so cool some of the products that are out there. I’m sure this would be a welcome gift too, for tons of people! I would love to try one of these. Anything beats the razor at this point! You had me at it seemed to grow a bit slower! I would probably try it on underarms. I actually don’t mind shaving my legs. I do it 365/365 so it’s just routine at this point. I have wanted to try something like this for a long time now. I have always wondered if it really works, now I really need to try it. This sounds like such a great option. I’m so sick of shaving! I want this! I get so tired of shaving my legs! Great, no more going to the wax salon for me with this cool product. That sounds like a better option than waxing! What a great way to remove unwanted hair. this might just be a xmas present for some one in my family that will remain nameless…. i would love to try this out on my legs! The hairs there grow so darn fast! This looks really interesting and something I would definitely be willing to try! I would love one of these to get rid of hair for good! I would LOVE to try that. I think these are the things of the future. I can’t wait to hear about your results after all the sessions. I have always wanted to try something like this.